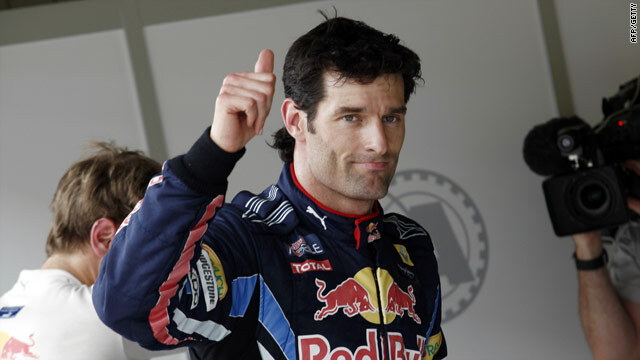 Webber give the thumbs up claiming his fourth pole position of the season. Webber lapped in one minute 26.295 seconds to occupy first place on the grid ahead of 2008 world champion Lewis Hamilton in his McLaren. Webber's Red Bull teammate Sebastian Vettel was third fastest, with reigning world champion Jenson Button fourth in the second McLaren. Australia's Webber will be chasing a hat-trick of race victories, after wins in Spain and Monaco, in Sunday's 58-lap race, hoping to pull clear of Vettel in the title race. The teammates are currently tied on 78 points, but Webber is ahead on race victories. He said that his team had finally got to grips with the Istanbul Park circuit in time for the crucial qualifying. "It hasn't been the smoothest of weekends for us in terms of getting the running in. Getting ready for 'quali' things started to get a little bit better," he told the post-qualifying press conference. "I was a little bit on the back foot going in to be honest, but I knew if I dug deep it could be OK. And it worked out for us. "I'm a little bit more confident for tomorrow to be honest." The Red Bull team have claimed all seven poles this season and will be looking to extend their lead in the constructors' championship. Mercedes pair Michael Schumacher, in fifth, and Nico Rosberg will share the third row, but it was another disappointing qualifying session for Ferrari in their 800th grand prix. Felipe Massa of Brazil qualified eighth but two-time world champion Fernando Alonso did not make the top 10 for the final session. The Spaniard made a mistake in Q2 and ended up 12th, the second straight time he has made a hash in qualifying after being forced to start from the pit lane in Monaco. Ferrari team principal Stefano Domenicali was not amused by their showing. "For sure the performance in qualifying was not up to our standard. We don't know why -- and we need to understand. For sure we were expecting much more performance," he told AFP.